The Way Through the Water - Lectionary Reflection for Lent 5C (Isaiah 43). Rivers, lakes, streams, and oceans—they all serve as sources of sustenance for life, but they can also serve as barriers that must be crossed. I am more aware than perhaps I normally would be when it comes to such things as river crossings, as my upcoming sabbatical has the theme of “River Crossings.” The theme is intended to highlight the way in which many biblical stories use various forms of water crossings to speak of change and transformation. Consider the Exodus story. The people were led by Moses through the sea to freedom (yes, they wandered for a long time in the wilderness, but they were still free). Later they would cross the Jordan into the Promised Land. There the freedom that emerged out of the crossing of the sea put down roots. The previous week’s reading from Joshua 5 tells us that when the people crossed the river, and began to settle into the Land, the celebrated Passover for the first time, according to the text, since the night before the escape from Egypt. Of course, there was the time of wandering in the wilderness that separated these two crossings, one out of Egypt and the other into Canaan. The reading before us is designated by the Revised Common Lectionary for the Fifth Sunday of Lent. This is the Sunday prior to the Triumphal Entry. We stand two weeks out from Easter. It is at this point in the Lenten journey that we return to Isaiah (Second Isaiah), who speaks a word to the exiles in Babylon. The message Isaiah delivers draws on the images of water crossings and streams of water that provide sustenance in the desert. There is what seems to be a conflicting message. On the one hand, Isaiah tells us to forget the past, forget the old, because God is doing a new thing. At the same time Isaiah calls on the people to remember what God has done in delivering the people out of Egypt, through the sea, and then on to wilderness, where they were formed as a people. Remember, but forget. Both are important to the purpose Isaiah lays out for the exiles. If they are to forget and remember, what is it that they are to remember and what is it they are forget. It would seem that Isaiah would have the people remember how God delivered the people out of Egypt and into freedom. Isaiah wants them to remember how God is faithful. That would important to people living in exile. Who is this God whom the prophet wants them to trust with their future? While past results are no guarantee of future success (so say stock prospectuses), we’re more likely to believe something will happen if there is a track record. I live in metro-Detroit. The people here have a love-hate relationship with their professional football team. They want to believe the Lions can win the Super Bowl, but it’s difficult to put faith in that possibility. If you’re a Patriot fan, well there is more of a track record. Thus, the reminder from Isaiah. Remember what God has done in the past. God delivered the people out of slavery through the sea. God provided for them as they lived in the wilderness, providing water for their sustenance. Indeed, “The wild animals will honor me, the jackals and the ostriches; for I give water in the wilderness, rivers in the desert.” Why? “To give drink to my chosen people.” Yes, nature affirms God’s faithfulness to God’s people. If they are to remember God’s faithfulness, what must they forget? The passage before us is not clear on that front. I would imagine Isaiah has in mind that which led to their exile. Forget the old ways, the ways that dominated the age of the monarchy. Yes, there were a few good kings, namely Hezekiah and Josiah, but the rest were not much to write home about. In fact, most of them were corrupt. They preyed on the people, even as they led them into idolatry. Remember how God delivered the nation but leave behind the ways that led to exile. This is because God is about to do a new thing. The prophet asks the people, on behalf of the God he represents: “I am about to do a new thing; now it springs forth, do you not perceive it?” Consider how God is paving the way through the wilderness. So, again what is this new thing? For Isaiah’s audience the answer may be a return to the homeland, and therefore, the end of exile. What it is for us, might be a bit different. One thing about the journey of faith is that much of that future is unknown. I’m one who likes to plan everything well in advance of a trip. I’m not one to just get in the car and head out, not knowing when or where we’ll stop. I need to make reservations, so I’ll know where I’m staying. That’s not possible with this journey. What we can do is trust that God is faithful. We can set out on the journey, much like Abraham and Sarah did, not knowing where and when we’ll be stopping, but know that as God did in the desert, God will provide. God will be there. Have faith. That seems to be the message Isaiah would have us embrace. The point, it seems, is this. God is providing a new thing, a new opportunity, a new way of living. The prophet Jeremiah spoke of a new covenant written on the heart rather than on stone (Jer. 31:31). The meaning seems similar. As we ponder this word from Isaiah, might we consider these words of interpretation offered by Ron Allen and Clark Williamson: “God is never simply the God of the past; God is the One who ever and again beckons God’s covenant partners to live forward in hope toward a future that will be a source of light and blessing” [Preaching the Old Testament, p. 137]. The invitation to us is this—the details with regard to the future have yet to be revealed, but that is good news, for the future is open. The other piece of good news is that God in Christ by the Spirit is with us on this journey. We have evidence that God has been faithful in the past. So, let us continue the Lenten journey, as God leads us through the water to springs of living water open to the future that God has for us. That future involves God’s shalom! 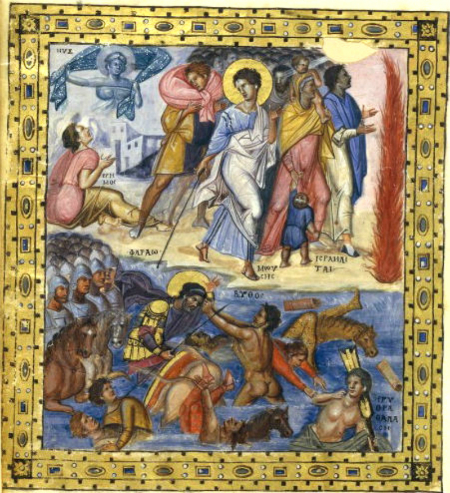 Picture Attribution: Crossing the Red Sea from the Paris Psalter, from Art in the Christian Tradition, a project of the Vanderbilt Divinity Library, Nashville, TN. http://diglib.library.vanderbilt.edu/act-imagelink.pl?RC=55814 [retrieved March 30, 2019]. Original source: commons.wikimedia.org/wiki/File:Paris_psaulter_gr139_fol419v.jpg.